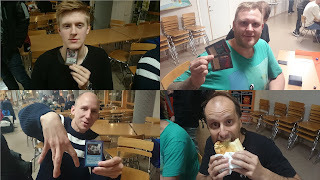 Last weekend I attended the first Gothenburg Invitational 93/94 tournament in Gothenburg. It was a smashing event, hosted by the Master of enchantments and fine beer that is Kenneth Mossberg. "With 10,000 dollars, we'd be millionaries! We could buy all kinds of useful things... like love!" It was a success. $12,692 has been contributed by over a hundred players of the mtgunderground. We've managed to do this without any support from the larger stores like SCG or CardKingdom. We've spread the word on informal channels, zero fucks given about the discomfort in asking fellow players to look at situations worse than thier own. This is not a political thing, it is a simple humanitarian thing. It's about acknowledging people who have been dealt a crappy hand in life and helping those who help in what way we can. It's about giving up a small part of our own luxury to help other people's lifes move from 'abysmal' to 'pretty harsh'. It's a little over two days left on the #MtgForLife campaign. It's a different climate than just a couple of days ago. I think a lot about what happened in Paris yesterday. I also think that thinking or praying isn't enough. Is there something that you can actually do, if even at a micro level, to help someone or change things for the better? The $12,257 we've collected for MSF of course wont create world peace alone. But it will help a lot more than $0 would. Everything is pretty fucked up right now. I'm glad to be around people who cares about changing it for the better rather than scream for more blood. Six days left for the #MtgForLife campaign. A few days back we reached the $10,000 milestone we sat out at the start, but we keep charging. Right now, we've raised $12,052. We're at at a level where it sends a signal to and from the Magic community at large. Sometimes we need to raise our eyes from our playmats, and when we do, we have the opportunity to make a small difference. Ball Lightning if I ever saw it. Thanks for being awesome. With the last week of the campaign in mind, let's check in on the rest of the mages from the BSK top8. 10,000 'murcan dollars! 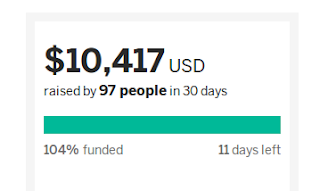 Well, actually $10,417 by now. You guys are awesome. So, if anyone from WotC is reading this and wants to get in, feel free to send me a message. But now, lets go to some hot tech from the elimination rounds of BSK. I give you the first half of the BSK top8. Do we really care about the starting numbers? Sure, it's impressive that a casual old school tournament in Borås without any real price support gathers more players than the main Vintage event of the MKM series tournament in Prague. And it's sweet to see that the old players keep coming back, and that new players are attracted to the format every year, showing up to play with what they have. But what I really like is this: That's during round six of the BSK tournament. Of the 55 players in the tournament, pretty much none has dropped. People are playing at the 0-5 table. Players play because they like the game and enjoy company of the other players. There are no draws here, and players gonna play.